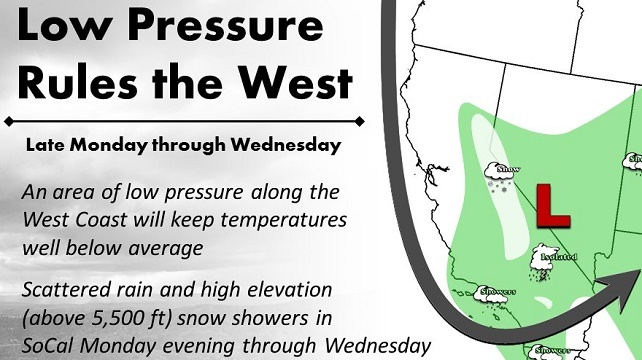 A low-pressure system moving over Southern California will bring cool temperatures with a chance of thunder showers for San Diego County starting late Monday through Wednesday, the National Weather Service is reporting. The unsettled weather is forecast to produce widely scattered showers that could produce up to a half-inch of rain in inland areas and a quarter-inch for coastal regions, according to the NWS. Chance of rain will be highest early Wednesday morning. The possibility of late-season snow is also forecast in mountain areas above 5,500 feet. Chilly temperatures are expected across San Diego County, with daytime highs Monday only reaching into the mid-60s for much of the coast and East County, according to the NWS. Daytime highs Tuesday and Wednesday are expected to hover in the low 60s. Overnight lows through early- to mid-week will hover in the low to mid 50s for much of the coastal and inland areas. As the system gets set to move into the area, the NWS has issued a wind advisory that remains in effect for the mountain areas through 4 a.m. Monday. Weather across San Diego County is expected to give way to sunny skies Thursday through Saturday, with a warming trend on tap.